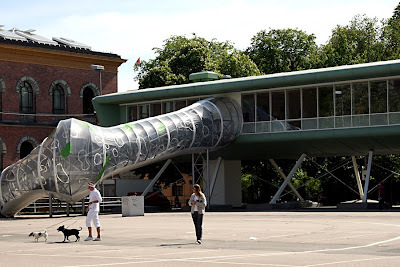 This is from "Spikersuppa" (nail soup) - a small park near the parliament building. 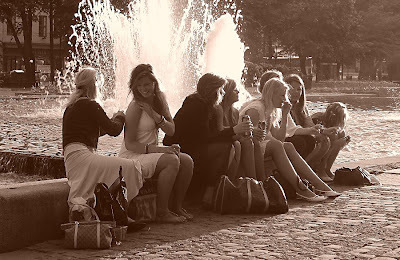 Some women having a rest by the fountain, probably on their way to a party somewhere. 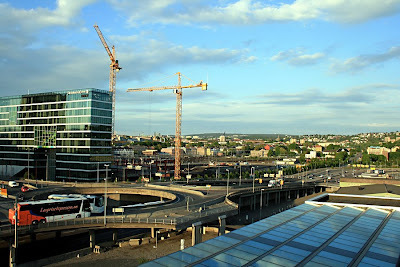 This big roundabout is called Trafikkmaskinen (the traffic machine) and is close to the railway station and the new operahouse. There is usually always quite a bit of traffic passing here. 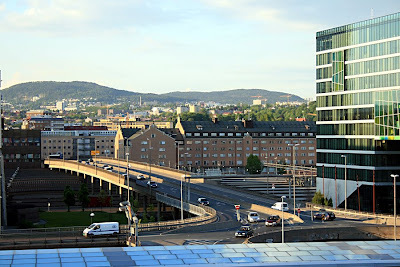 In this photo you can see Posthuset (with the sign of Aftenposten on the top) and the Thon Hotel Opera which is quite new. 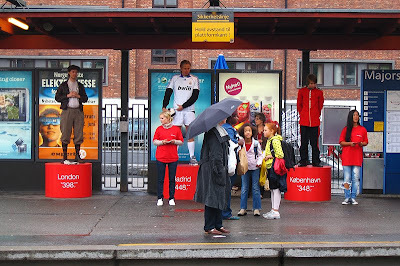 The hotel is situated right next to the railway station, so it's quite handy for tourists. 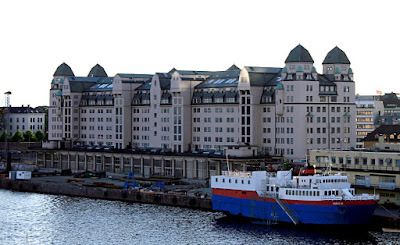 Posthuset was built in 1975 and was at that time the tallest building in Oslo with 80 meters and 19 floors. This changed in 1990 when the Plaza hotel, 117 meters tall, was built. Posthuset was earlier known as Postgirobygget and was considered by many to be so ugly it should be torn down. In 2003 the building was renovated; 7 floors was added to it and the building was split into two towers. 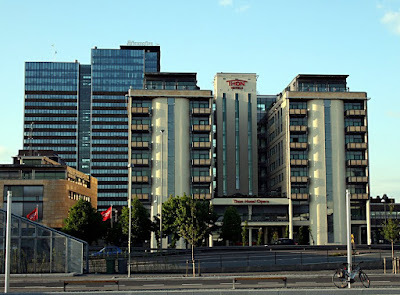 It was turned into an office building and Aftenposten (one of the main newspapers of Norway) moved in. The building is now 110 meters tall and has 26 floors. This ferry; Stena Line, leaves Oslo every evening to take passengers to Fredrikshavn in Denmark. You can bring your car if you want to drive through Denmark to Germany (and the rest of Europe), or you can take a round trip of approximately 24 hours. The ferry offers tax free alcohol, tobacco, candy and other merchandises. There are several restaurants on board, and there is usually entertainment and dancing in the evening. 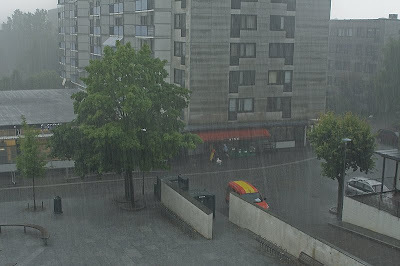 We had a really heavy rainfall in Oslo earlier today! The Norwegian Red Cross (Norges Røde Kors) was founded September 22, 1865 by prime minister Frederik Stang. In 1907 the Norwegian Ministry of Defence authorized the organization for voluntary medical aid in war. 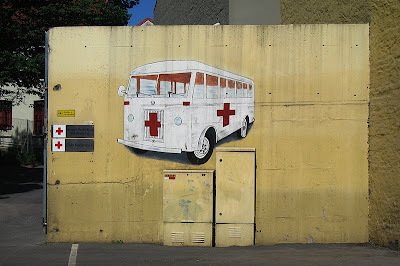 The Norwegian Red Cross was one of the first national organizations in the International Red Cross. The organization now has 170,000 members and provides a variety of humanitarian services, including care for old and the infirm, prisoner visits, mountain rescue, and international work. 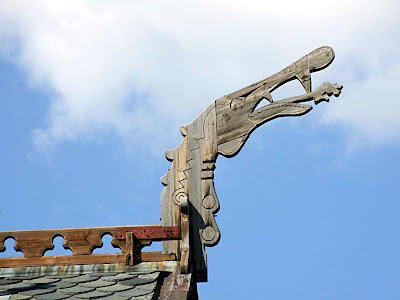 This is Frognerseteren, an old building from the 1890's, built in the Dragon style of the époque. There is a restaurant/café there, and the building is used for weddings and parties. 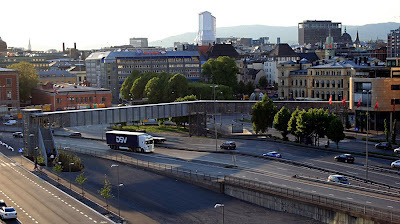 Lots of tourists visit to see the fantastic view over Oslo. 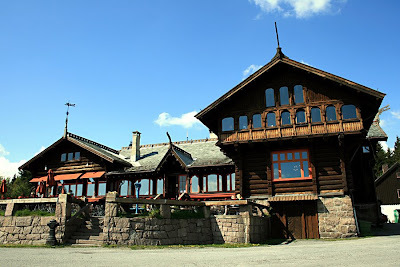 Frognerseteren is on top of Holmenkollen, 435 meters above the city. 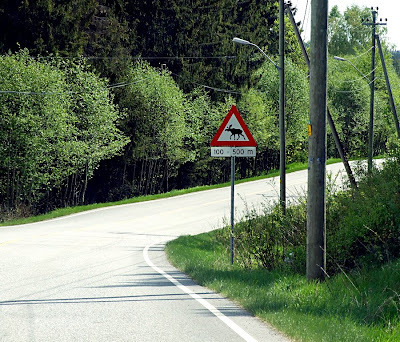 A common road sign in Norway: Beware of elks. 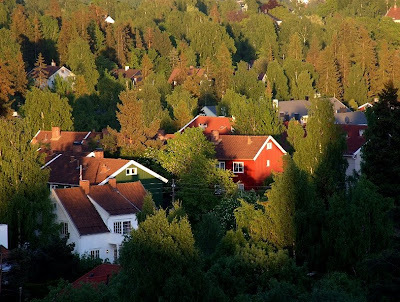 This photo is from Sørkedalen, north of Oslo center. In this area you will be able to see elks sometimes. There are feeding places where they gather, usually in the evening when the sun sets. Do not tear me down! 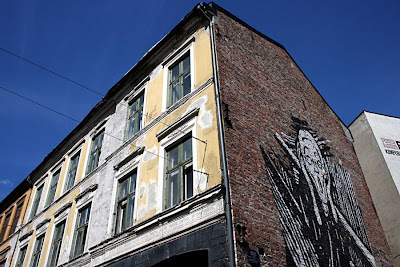 This is the Blitz building in Pilestredet, where Edvard Munch lived for a while. The building was empty for many years, but was occupied by radical youths back in the 1980's. 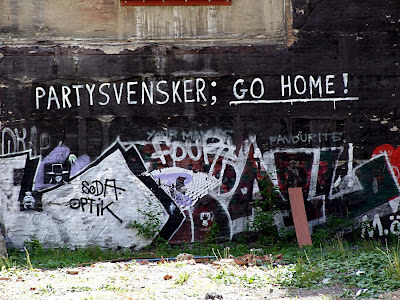 There were demonstrations and fights with the police, but the city has later agreed to let the building be used as "an autonomous counterculture-centre in central Oslo", to use Blitz' own words. There is a variety of political and countercultural activities going on at Blitz. Monday trough friday Café Blitz is open from 12am - 6pm. At the Café you get Oslos cheapest and definitely best vegetarian/vegan food and drinks. 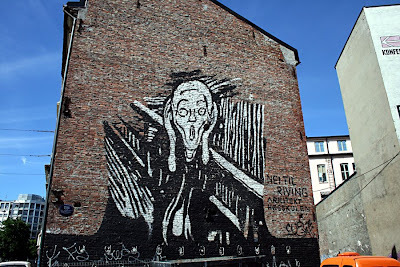 I don't know if the building will be standing or not, but I hope it will - mostly because of the Scream painting on the side of the building. 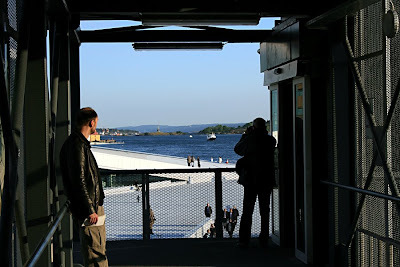 If you leave the railway station at the exits towards the fjord, you'll find a tunnel that takes you over the highway with it's heavy traffic, and to the other side where you find the new opera house. 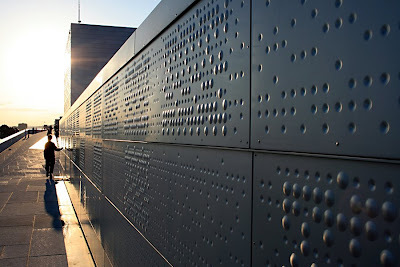 The decoration on top of the opera house reminds me of Braille writing (what blind people use to read). What is this strange building behind the National Gallery? I have no idea, I couldn't find a sign. 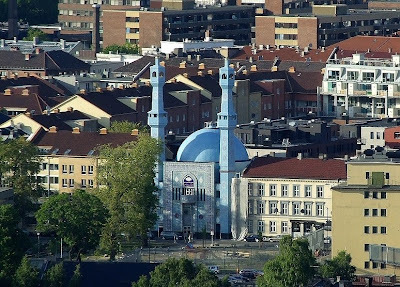 This is the mosque in the Åkeberg road at Tøyen in Oslo. It is the second largest mosque in Norway and was built in 1995. 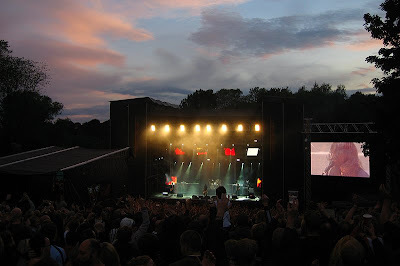 The photo was taken at Ekebergåsen by Mark Wilkinson. 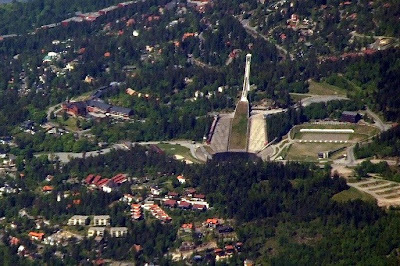 We've showed you lots of pictures of the ski jump, Holmenkollen, and the surrounding area. 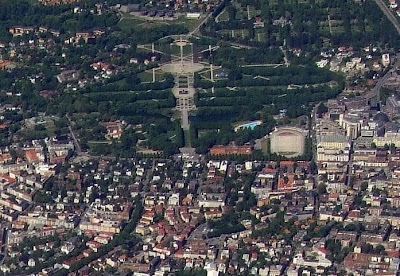 But this is the first time we show you an aerial view of this famous place. Thanks to Mark Wilkinson who took a lot of really nice photos when his plane passed over Oslo on his way home to the UK. 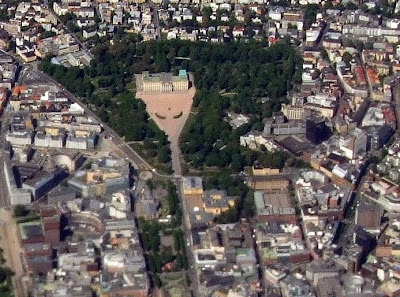 This is a photo of the Majorstuen and Frogner area, and the Vigeland Park (Frognerparken) with all the wonderful sculptures by Gustav Vigeland. Thanks to Mark Wilkinson for letting us use his photos! 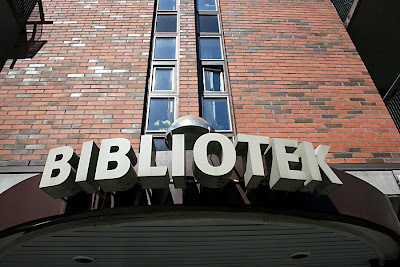 There are public libraries all over the country in Norway. 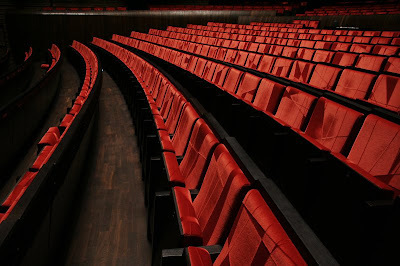 These are popular and much used. 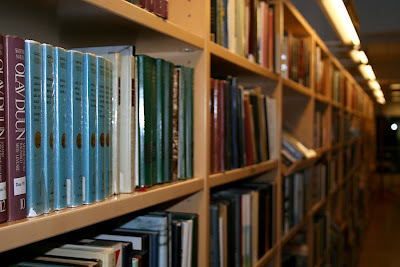 You will find a wide range of books there, and if they don't have what you want, they usually can get it from other libraries. You can also borrow movies (dvd) and music, and read the latest magazines and newspapers. If you need to get online, most libraries have computers where you can surf the net for free (usually for 30 minutes). The schools have their own libraries and children are encouraged to borrow and read. I've used the public libraries since I was very young and still go there regularly. It's a good thing as both my son and I love to read. 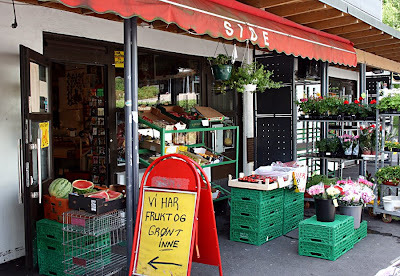 Hovseter Side Frukt & Grønt (Fruits and vegetables) is a really nice shop to live close to. They're open every day, even Sundays (most shops are closed on Sundays in Norway). Apart from fruits and vegetables, you'll find lots of products from other countries; Turkish bread, børek, spices, feta cheese, olives etc. 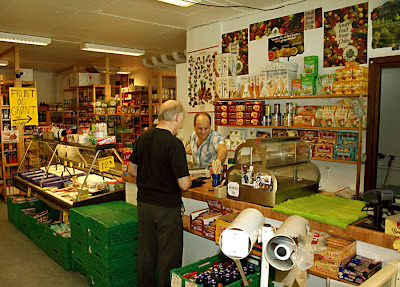 They have a wide range of tea and coffee, canned products and snacks of all kinds. As we're expecting company today, we went to buy some Italian icecream. Yum! The sign tells you that the fruit and vegetables can be found inside. The shop has a cold-storage chamber to keep these goods fresh and nice.